Greg Owen has described his recent form as "fantastic"
Nottinghamshire golfer Greg Owen has said he feels fortunate after enjoying the best of the morning conditions to shoot a first round 68 at the Open. Owen, who was briefly club house leader at St Andrews on four-under-par, played his 18 holes before 40-50mph wind guests were expected to arrive in the afternoon and early evening. "Looking at the weather forecast, I may actually have been very fortunate. "The word is that I may have got the best of it," the 43-year-old said. Owen's family home is now in Windermere, Florida, where he has been based for 11 years. But he still has a property in his native Mansfield and his homecoming has gone well on the back of some good recent form. Owen is making his eighth appearance at The Open and his second at St Andrews, where he tied for 55th in 2000. He enjoyed his best finish at Hoylake in 2006 when he tied for 22nd, but his most memorable moment came at Royal Lytham in 2001, when, at the long 11th, he became only the sixth golfer in Open history to register an albatross, helping him to briefly top the leaderboard. After banking $648,000 for finishing second at the St Jude Classic in early June in Tennessee, he was back in the top 10 again a month later in the Greenbrier Classic in West Virginia, finishing sixth. "The last month or so has been fantastic," Owen told BBC Sport. "I've gone back to a lot of thoughts from my old European days. It all seems to be working very well at the moment and I'm putting really nicely. 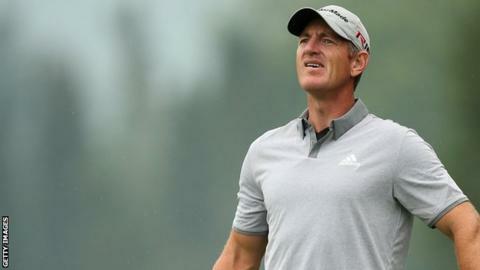 "I hit it close on the first to get off to good start, birdied the last and played fairly nice in between. I had just one dropped shot when I found a fairway bunker on 13 with the straightest shot I hit all day."